I have a confession about this picture. I didn’t think it should be a “Photo of the Day”. I looked at it for balance and exposure and composition and by all standard measures it didn’t make the grade but it had one thing going for it that the others didn’t. It appealed to my heart. You may not see it or feel it. That’s why photography is an art. 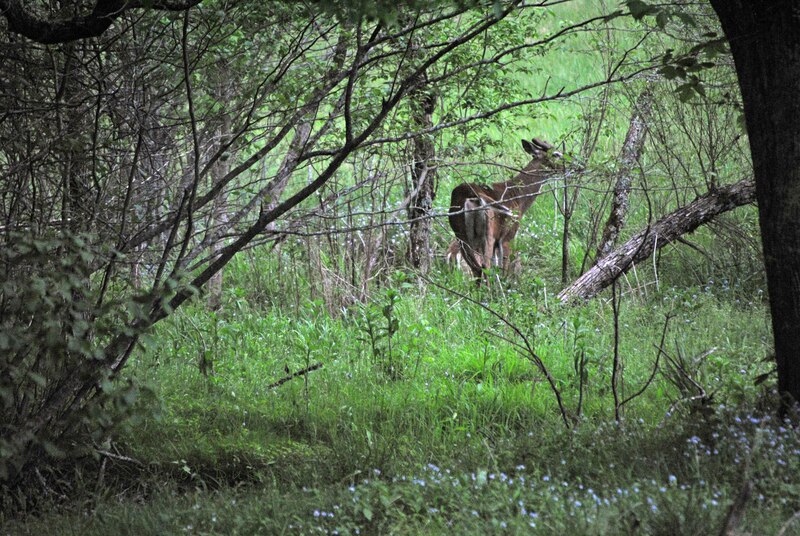 But here was a deer (2 deer actually – do you see the 2nd one?) with the last light of the day filtering through the trees. Just barely enough for the shot. There are flowers in the foreground. Something about it won me over. I hope you see just a little of what I see when I look at this one. I thought of Over the river and through the woods etc. So Through the woods it became. Is there a fawn on the left side of the deer?? I think so. Definitely another deer. I didn’t see it when I took the picture but once I had it blown up on the computer it’s rump with the white tail was clearly there.